We have had many retail customers ask where we get the decor and signs that we install in their markets. The answer is that we make most of them from raw materials. Nearly every day we receive shipments of a variety of different materials that we cut, print, paint, and shape into the decor that makes these stores beautiful. The materials we use for our products range from metal to wood and everything in-between. Nearly every day we receive shipments of a variety of different materials that we cut, print, paint, and shape into the decor that makes these stores beautiful. Essentially, if a product is made of metal, including freezer locator brackets, floor stands, checkstand lights, or a hanging trellis, the material arrives at our shop as raw steel tubing or sheet metal. Our fabricator cuts, bends and welds it all together before it goes to powder coat. Most of the metal brackets that we sell are even hand fabricated. 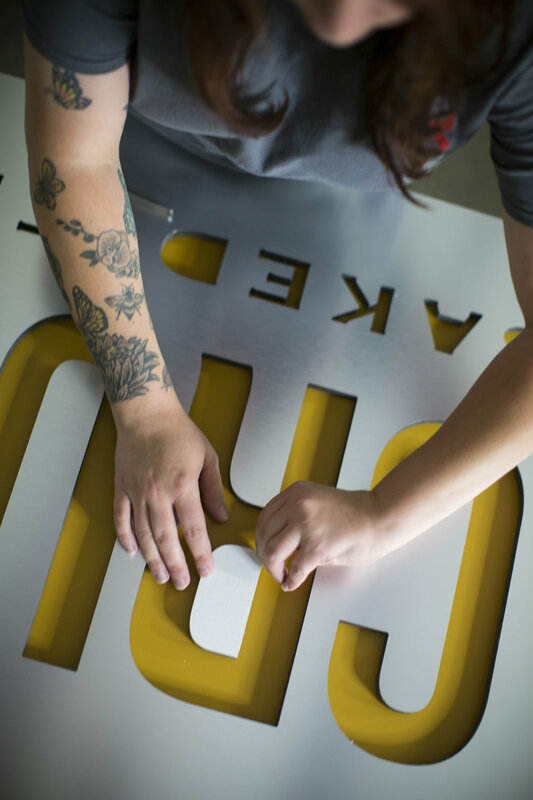 From a basic sign bracket (that customers might never see) to a decorative focal point that draws customers in, we can fabricate it! Here at Decorworx, we have a small woodshop where we turn engineered wood products and hardwoods into shadowboxes, crown moldings, wood accents, and many more decorative items. We stain and clear coat wood to bring out the beauty of the wood grain, or even paint it an endless array of colors. We can add faux brick and dry stack rock accents to your store using foam panels that almost look like the real thing! The text that we often install in store departments has a brushed aluminum appearance which we call wrisco. It can also be painted wood or shiny acrylic. We are able to route text on our CNC router tables into an endless combination of sizes, fonts, and materials. This is a small list of the dozens of different materials that we use to transform your store.